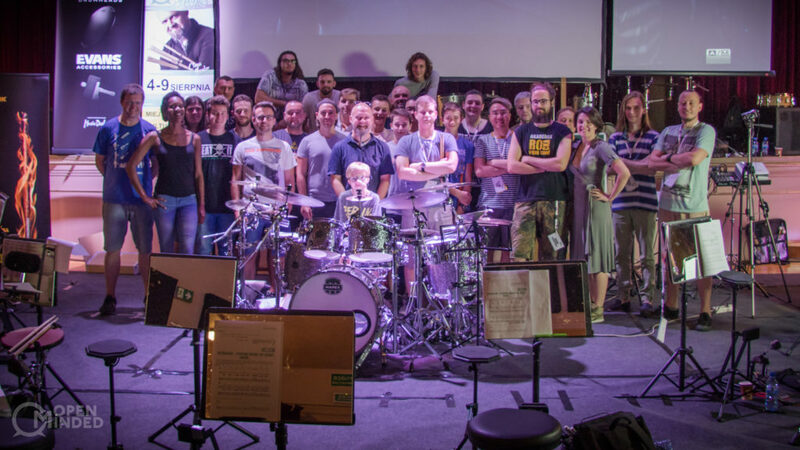 The second Polish edition of the Open Minded Camp conducted by the world-class drummer/educator, Claus Hessler, was held between Aug 4 and 9, 2018. 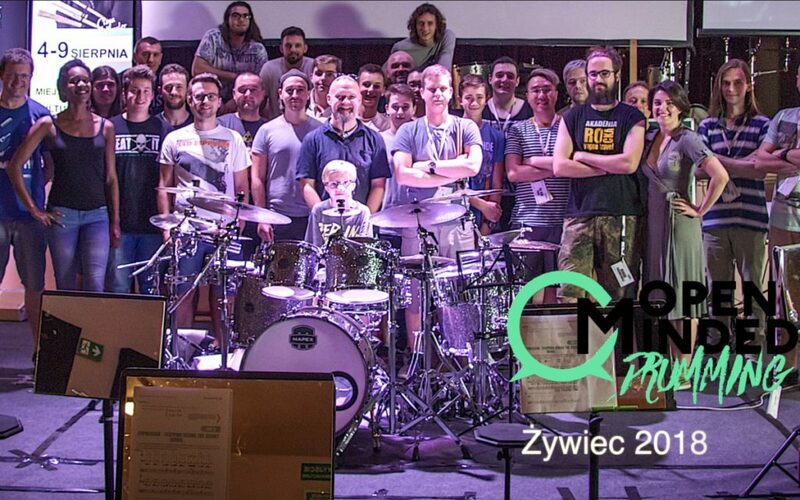 Most of the other Polish media focusing on drums have discussed the advantages of this workshop organized by Szymon Fortuna in great detail. We, however, decided to go further and experience the camp from the attendants’ side. The following is our report also including our subjective feelings and impressions. As we were busy reporting from the massive Pol’and’Rock festival (about 700,000 attendants this year), which overlapped with the first two days of the camp. For that reason, we arrived in Żywiec, Poland, on Sunday the 5th having travelled directly from the festival. This meant we had missed two days of the workshops and such topics covered then as drum tuning techniques and an introduction to the Moeller technique. As we found out later, we were able to obtain this information from the camp attendants. Sunday evening was the perfect moment to meet all those present and integrate with them over a pint of local beer. The spirits were high and there were no signs of anybody being tired or overloaded with information. Incidentally, this impression remained for the rest of the event, maybe with the exception of the last day, which we shall expand on a bit later. Our first day at the camp began at 9:00 in the morning. 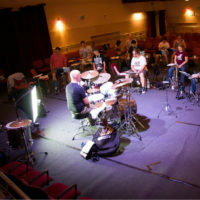 All the seats were ready, equipped with a sheet note stand and a mirror, a double foot pedal practice pad, a 6-inch practice pad to hit on with sticks, as well as a drum throne. We took some our own stuff with us and think Zildjian Low Volume work great in such situations. We used 13″ hats, which didn’t disturb the other participants and provided us with greater comfort when exercising. At 9:15, we kicked off with a warm-up, which was conducted every morning by Szymon Fortuna. Those were simple, yet excellent, exercises aimed at gaining the understanding of the body, and the way wrists, fingers and forearms function. Szymon also put some emphasis on rebound, maintaining proper posture, and exercising at different levels of dynamics. After 45 minutes of warm-up and a short break, we started a five-hour master class with Claus Hessler, which was only interrupted by a dinner break. 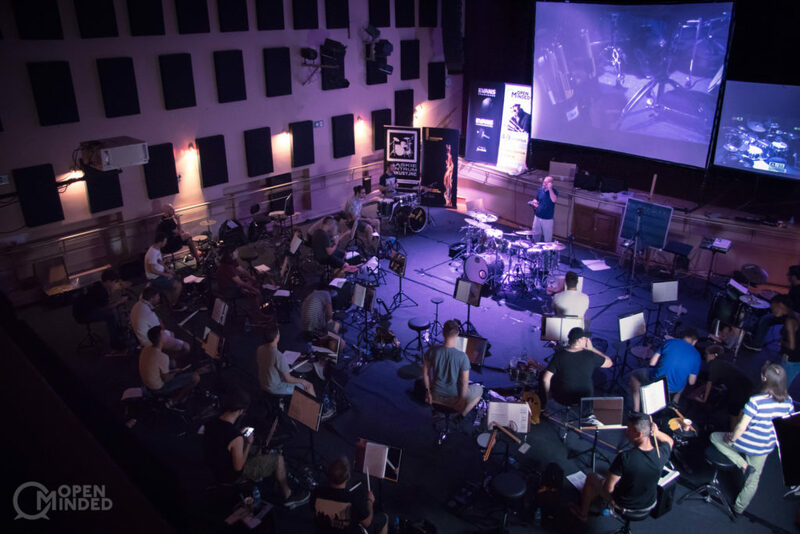 The participants had a few full drum kits set up at their disposal inside the Żywiec Civic Center, which meant everybody had the opportunity to practice or think through the topics discussed in class. Claus Hessler conducted his camp according to a specific plan. He is a very communicative person who uses a simple language without too much sophisticated vocabulary. He has the ability to describe complex matters in simple terms, with help of comparisons, and a bit of joke and loose atmosphere. All the classes were conducted in English, but at no time did we get the impression that anybody was uncomfortable with this fact. Claus’ plan is to explain to the attendants how to achieve independence, coordination and ease when playing drums, but also to enrich one’s drumming vocabulary. The key phrase to grasping that idea seems to be ‘open minded’. What struck us the most was that each and every set of exercises was possible to be implemented by every participant regardless of his or her level of advancement. Only the last day caused some difficulties to the attendants. That was when Claus got into the subject of slowing rhythmic values down while maintaining the same accenting. It wasn’t an easy task to do, but it certainly was understandable and, as such, feasible to implement at home or practice room. 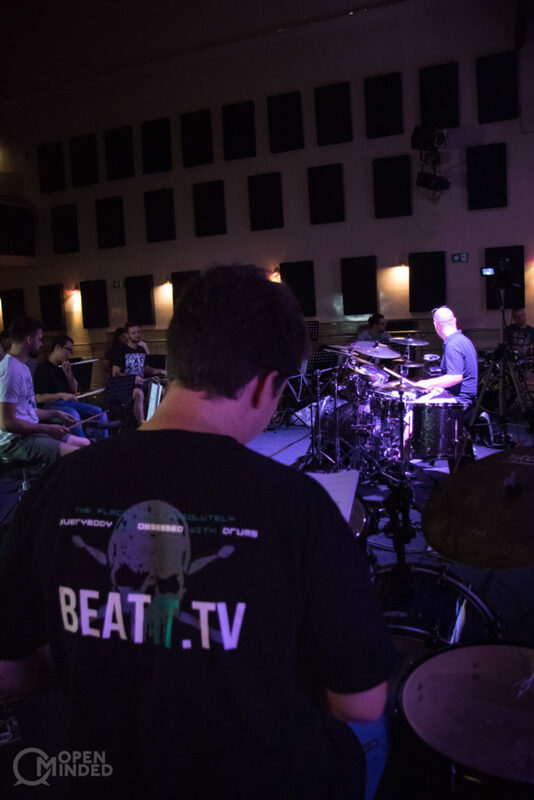 It is worth mentioning that each of the participants received a set of charts with all the exercises and a description of how they should be played. Claus said many times that these few pages could be the basis for a serious drumming handbook. 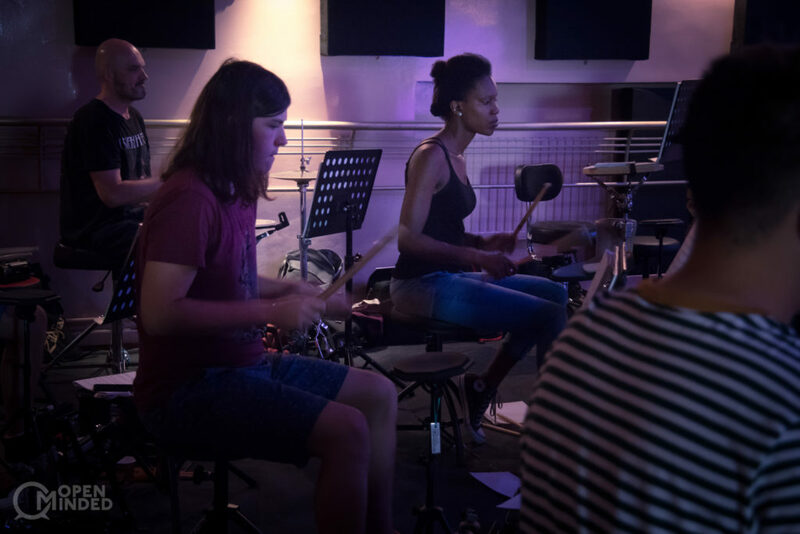 The drumming camp with Claus Hessler seems to have motivated the group to work on improving their skills. Everyone was given knowledge on how to achieve better results in his or her drum playing and cross ‘the secret door’. zwalniania wartości rytmicznych przy zachowaniu takiego samego przebiegu akcentowania w taktach. An important part of the camp were daily Q&A sessions, where Claus would answer virtually every single question asked by the participants. There were quite a few of them, starting from holding sticks through to samba playing and double bass drum techniques. The last day of the workshop was reserved for the organizers. It was kicked off by Szymon Fortuna, who presented the possibilities of Ableton in a detailed and yet straightforward way. The next speaker was Editor-in-Chief of the ‘Perkusista’ magazine, Maciej Nowak, who delivered a presentation on the rules of endorsement in the music world. After the speeches, each of the camp’s participants received a certificate of attendance. The evening saw both organizers perform on stage. Szymon Fortuna did a set with his band while Claus Hessler appeared as the main attraction of the evening. Dear en.beatit.tv viewers! 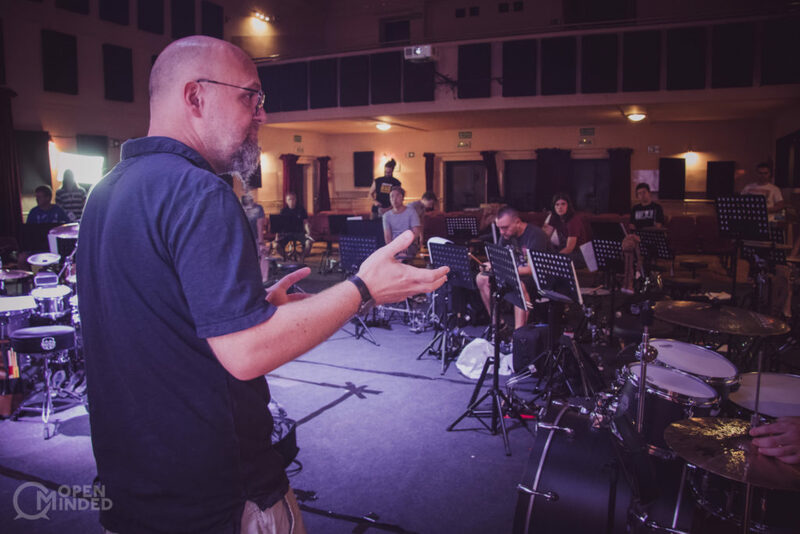 Here is a video report from Open Minded Drum Camp 2018!